The final Euro-zone CPI supported EUR against USD which is under pressure due to US-China trade war. 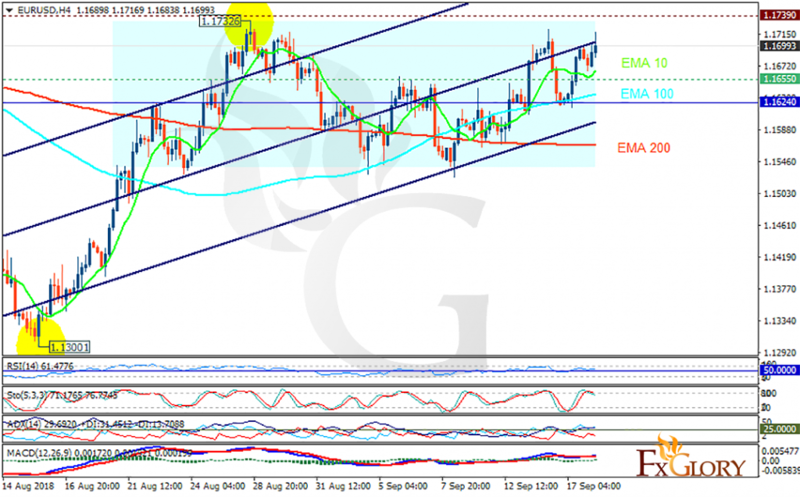 The support rests at 1.16550 with resistance at 1.17390 which both lines are above the weekly pivot point at 1.16240. The EMA of 10 is moving with bearish bias in the descendant channel and it is above the EMA of 200 and the EMA of 100. The RSI is moving above the 50 level, the Stochastic is moving in high ranges, showing downward momentum and the MACD line is above the signal line in the positive territory. The ADX is showing buy signal. The price will be fluctuating within the support and resistance area, however, there might be some slight bullish movement which might push the price up to 1.18.